New Earth Blog – Page 3 Events | New Earth - Life Starts Here. Living Begins Now. With the lack of nutrients provided in our modern diet, taking supplements has become necessary to help ensure we provide our bodies with what they need to thrive. The question is: how do we know which ones to take? Unless you have an extensive background in some sort of combination of biology, nutrition, and chemistry, choosing a safe supplement can be challenging. How do you know if a supplement is safe? How do you know if a supplement will be helpful? In other words, how do you decipher the good from the bad and the exceptional from the average? You can look for some key accreditations, with one of the most important being registered by NSF International to the FDA’s GMPs (Good Manufacturing Practices). At New Earth, we’ve taken the time to make our products Certified Kosher, Certified Halal, USDA-certified organic, NSF GMP-registered, and GMP for SportsTM-registered. GMP registration is the gold standard of the food industry. Every product contains exactly what it says it does on the label. The NSF registration lets you know that the company complies with NSF standards and procedures. Being NSF registered for GMP is not a one-time event. Companies must submit their manufacturing facility to unannounced NSF inspections where every stage of a product’s development is thoroughly evaluated. It means companies like New Earth, that hold this registration, are dedicated to the integrity of their products and your safety. When it comes to our ingredients it’s not about trends or what sounds cool. It’s much more than that. It’s science and studies at its finest. It’s a team of professionals dedicated to studying, researching, testing and formulating. Our ingredients are thoroughly tested and verified 100% pure. All are crafted with care and precision from premium quality, whole natural foods. And every product comes with our satisfaction guarantee. A company’s strength rests on the value of its products. At New Earth, there is only one acceptable standard: Absolute Excellence. See for yourself, risk-free with our 90-day money back guarantee. Essential Fatty Acids: Why Are They Essential? After decades of being told otherwise, it’s difficult to swallow the idea that fat can be good for your health. However, for our bodies to remain healthy, we need to take in the right amounts of essential fatty acids (EFAs). Are you eating the right fats? You need enough essential fatty acids in your diet to prevent deficiency and keep you healthy. Essential fatty acids are those fats that our bodies cannot produce by themselves, so they must be obtained from our diets. Although your body can synthesize most of the fats it needs from the food you consume, there are two essential fatty acids that your body is unable to synthesize – linoleic acid (LA) and alpha-linoleic acid (ALA). These fats can only be found in our foods and they’re used to build some specialized fats known as omega-3 and omega-6 fatty acids that help in the normal functioning of all body tissues. Docosahexaenoic acid (DHA) and eicosapentaenoic acid (EPA) are types of omega-3 fatty acids that originate from ALA. 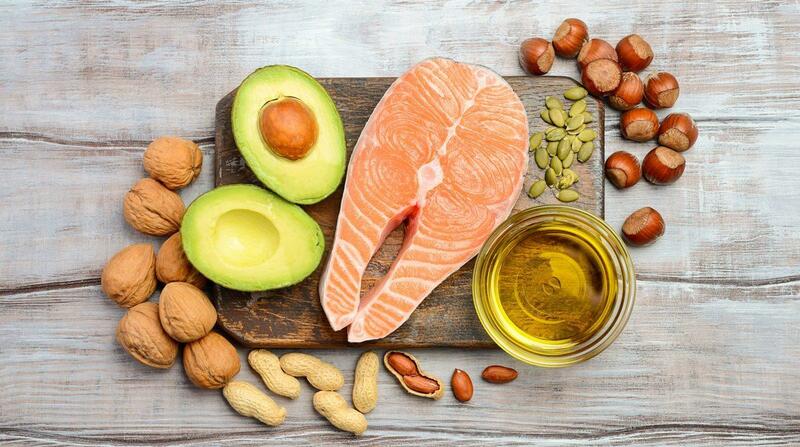 These highly unsaturated fats play important roles in brain development and functioning. Arachidonic acid (AA) and gamma-linolenic acid (GLA) are omega-6 fatty acids derived from LA. The derivation of these fats can be easily impaired by several factors, which makes it necessary to supplement them with dietary sources. There are many health benefits associated with consuming EFAs with the biggest being that they are essential for our wellbeing and our bodies cannot produce them. They also have a positive impact on heart health, brain function and the bodies natural responses. EFAs can be obtained from a variety of high-quality food sources. Foods high in omega-3 fatty acids include organic Wild Microalgae®, salmon, sardines, chia seeds, flax seeds, and walnuts. Foods high in omega-6 fatty acids include almonds, cashew nuts, and sunflower seeds. The modern diet typically contains more omega-6 fatty acids than required. Therefore, although omega-6 fats are essential, most people should reduce their intake. Why Take Essential Fatty Acids Supplements? Oftentimes we don’t get everything required for a healthy internal ecosystem. Consuming high-quality nutritional supplements can help fill these gaps and help to improve the quality of your overall health. Food-Based or Synthetic Supplements- Does It Matter? Most of us were taught the importance of nutrition and how taking supplements helps to support the minerals and vitamins we aren’t getting through our diet. Most of our education on the subject of supplements ended there, but it shouldn’t have. With the desire to live a long healthy life many are blindly taking supplements that are simply not doing the job because the truth is, vitamins are not created equally. What are Synthetic and Food-Based Supplements? Synthetic Supplements are just as they sound, human-made. It’s common knowledge that foods consumed in their most natural states are the best. Today, processed foods are very different from their original state. The same thing goes for synthetic vitamins. These are vitamins that are made artificially through an industrial process using chemicals. They are bonded with ingredients that are designed to mimic natural vitamins, and our bodies recognize this. For example, you may think that you’re consuming a calcium supplement, but it may be filled with other minerals that are foreign to the body. Therefore, your body will try to remove as much of it as possible. This means a very little amount of synthetic calcium will be entering your body. Food-Based Supplements are close to what nature intended as they closely match the vitamin complexes found in nature. They are typically made by growing nutrients in yeast or harvested in their wild state. These food-based supplements usually contain the cofactors required to assist the body with the absorption of the nutrients making them more effective. Your body can easily absorb nutrients from natural supplements and much more readily than it can absorb synthetic supplements. When naturally produced, vitamins and minerals are in better harmony with you. Natural supplements are extracted from food that is suitable for consumption by human beings. Ingredients derived from foods that aren’t suitable for human consumption should be avoided because it’s not natural and your body won’t benefit from it. Most people consume excessive calories found in synthetic supplements in pursuit of natural ingredients. However, natural foods cut straight to the chase by complimenting healthy meals. At New Earth, we take the quality and purity or our food-based supplements seriously. You will find one ingredient in every supplement we offer, organic Wild MicroalgaeTM. Our Wild Microalgae is a fragile organism. It takes sophisticated technological know-how to harvest, cool, process, and dry in a way that preserves its delicate balance of nutrients. It goes from harvest to quick cooling to multiple cleanings to water removal to fast freezing and storage, all in a few hours. We are responsible for getting products out of the wild and to your table. Albert Einstein once said, “The only source of knowledge is experience.” We agree. Learn more about New Earth and the quality of purity of our food based supplements here. Founded in southern Oregon, New Earth has been perfecting the best supplements in the industry for over 30 years. We carefully select the finest ingredients so you can take comfort when purchasing our whole food products. And we have a secret weapon: organic Wild MicroalgaeTM (AFA). Wild Microalgae is a superfood like no other. This powerful strain of algae is special. Nestled in Klamath Lake, the only place in the world where this unique superfood resides in abundance, AFA is sought after worldwide for its nutritional properties. With over 30 years of experience, our team of engineers has designed specific machinery and techniques to gather only the best Wild Microalgae. Each summer when the algae blooms, the team puts these harvesters to work to gather pure Wild Microalgae and begin the process of creating some of the worlds finest supplements. When harvested, if microalgae is not processed carefully and properly, it loses some of its beneficial properties. This is why we cool the algae rapidly upon harvesting, and quickly process the microalgae, thereby preserving the integrity of the nutrients and compounds. The total time from harvest to freeze is a mere four hours thus maintaining the incredible nutrient profile of the AFA. When it comes time to getting the AFA ready for encapsulation we utilize a low-temperature drying process that preserves phytonutrients. Testing indicates that the quality of this drying system is superior to freeze-drying, especially for heat-sensitive components such as vitamins, chlorophyll, and enzymes. We take great pride in producing clean, safe, premium quality, health supplements. We maintain the quality of the AFA by harvesting and processing via an in-house Quality Assurance program. Every lot (24 hours) of harvest undergoes stringent Quality Control procedures. In addition to in-house testing, regular analyses are conducted by independent certified laboratories to verify the potency and purity of New Earth’s microalgae. To take it a step further we’ve earned the certifications that matter most. New Earth supplements are certified Kosher, Halal, Paleo, and USDA-organic. We maintain our own manufacturing facilities registered by NSF International to FDA’s Good Manufacturing Practices (GMP) and GMP for SportTM. Our ingredients are thoroughly tested and verified 100% pure. Every product contains exactly what it says on the label. All are crafted with care and precision from premium quality whole natural foods. And every product comes with our satisfaction guarantee. At New Earth, we are responsible for getting products out of the wild and to your table, and we take that responsibility very seriously. You won’t find another company like us.